To say I'm excited about this year is a spectacular understatement. After a couple of years of hinting begging, my husband has finally given in and agreed to a holiday in Florida. It's our tenth wedding anniversary this year, so we'd always intended to go on a special holiday in 2016. I think Dan was leaning more towards a fortnight all inclusive in the Maldives... which, don't get me wrong, would be incredible... hmmm is it too late to change my mind!? We got married in America and haven't been back since, so it'll be lovely to go this year to celebrate our anniversary. Plus, Dylan and Meryn are the perfect age now to really get the most out of a holiday to Orlando. Ayden will be three, which is a little young to remember everything and go on all the rides, but I know he'll have the most wonderful time too. So, I'm milking this for all it's worth to get every last second of excitement and build-up before we go. Any excuse to research, plan and work myself up into an over-excited mess! I've read blogs, subscribed to YouTube channels, made lists, bought myself a notebook. It's on! If you're planning a trip to Disney World, I hope you'll enjoy my videos and find them useful for your own trip. If you've been before and have some tips to share, please do leave them in the comments section below. I really would love to hear them. 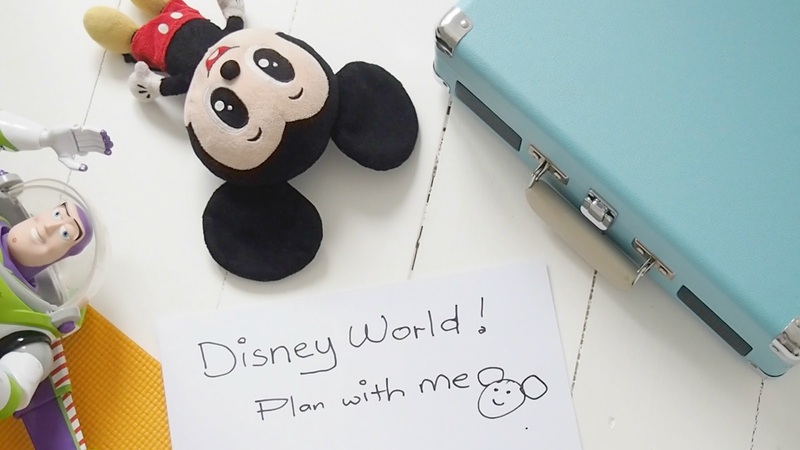 I hope you enjoy the first of my Disney World plan with me videos. If there are any particular subjects you would like me to look into, please let me know. Looking forward to your plans. How exciting! I hope we can take our children one day when they are bit older too. I want to come too! I absolutely loved every second of the planning and the holiday. Best one ever! Eee how very exciting! Disney World is my dream, I'm glad to hear the begging works, I shall continue! I'm a big holiday planner and I've been to Orlando a number of times. We love Universal and IOA, as my son is 19 he's too old for Disney. Some great sites for planning are The Dibb, Visit Orlando, Orlando Informer website and the Orlando Time Facebook page. Looking forward to seeing your videos! Oh wow how exciting! I would love to visit there one day with the kids! you are a lucky ducky! I am dying to take L to Disney world (and go myself) I hope you have an amazing time and happy anniversary! we spent our 10th wedding anniversary in Florida and it was the absolute holiday of a life time. You will love it I promise! How exciting! I do love Florida though have never been to Disney but I've read other posts and there seems so much to do even for littler ones. Mini Travellers and Five Adventurers have both blogged about it, I think. Hope you enjoy the build up and trip. You should check out Michelle's posts over at Purple Pumpkin Blog. She has a wealth of information from her various visits. Disney isn't me at all, and apart from the rides, it's not somewhere I aspire to visit. Thankfully N isn't into Disney either and the OH never wants to go on holiday, so there's little chance of being asked to go.